If — as the White House promised just days ago — the amnesty were confined to those who now actually have DACA work permits (or even those who had them but didn’t renew), administering the amnesty would be relatively straightforward….But going beyond DACA beneficiaries to those who could have applied but didn’t is a different thing….The other work of USCIS would grind to a halt, delaying other legal immigration applications….What’s more, expanding the amnesty beyond DACA beneficiaries is morally dubious. The reason they have a compelling case for amnesty before all enforcement measures are in place and legal immigration curbed is that not only did they arrive here as minors but they voluntarily came forward and provided their information to the government. Those who chose not to do so should not be granted the same extraordinary act of mercy. ….Then there’s the legal immigration “cuts.” The outline says that no new applications for the visa lottery and the chain-migration categories would be accepted, limiting family immigration to spouses and minor children. Great! 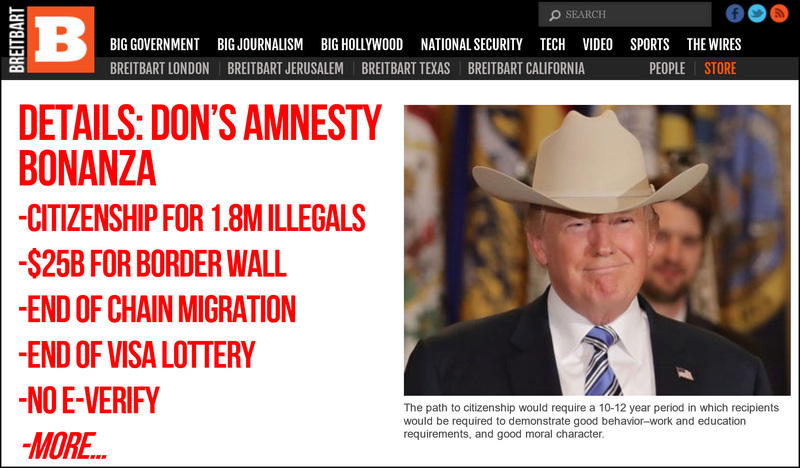 But it also provides for the continuation of those categories (and reallocation of the lottery visas) until the admission of all 4 million people on the current chain-migration waiting lists….In other words, legal immigration would not actually be reduced until after President Kamala Harris’s successor took office. I don’t have any comment about this. I just wanted to give you a taste of what the other side thinks of Trump’s proposal. The liberal side is aghast at the reductions in legal immigration. The conservative side is aghast that the reductions aren’t harsh enough. That doesn’t leave much room to cut a deal. If there’s going to be any agreement here, it’s going to be because there are enough moderates on both sides that they can pass a bill with no help from the hardliners on both sides.